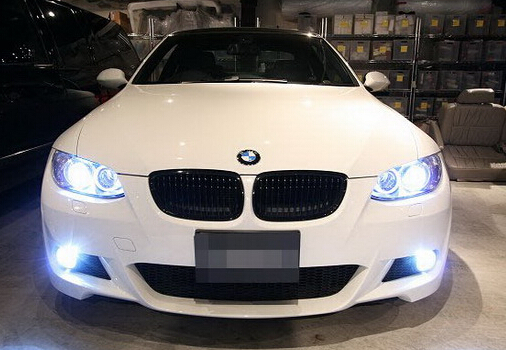 For a long time, the car’s brake lights, turn signals, reversing lamp and the rear fog lamps are 21 w to 27 w, brightness is from 280 to 570 lumens of tungsten filament lamp as light source.Car tail lights, parking lights, side lights and turn signals flash adopt 4 w and 10 w tungsten lamps, brightness is 40 to 130 lumens, car headlights, the use of the high brightness xenon fluorescent tube (HID).But in automotive lighting, LED as light source are used more and more.The tail of the central high brake lights was among the first to adopt LED car light.In addition, the lights on the market, car lighting and other indicators, such as brake lights, turn signals, and the lights have to switch to LED bulbs.In recent years, car lights, such as daytime running lights (DRL), as well as the front lights are low to switching the LED bulbs.Car headlights are also expected quickly to switch to high brightness leds.In addition, inside the body, some of the car display backlight are using LED as light source, such as the dashboard and TFT display. White LED color temperature of about 6000K, visually almost identical to natural light. Since the human eye’s ability to distinguish colors in natural background conditions are best. At night, the human eye only in the case of a natural color, or road edge on the scene have a good ability to discriminate. The average life span for the LED lamp is higher than tungsten filament lamp and fluorescent lamp brightness length, and is more stable and reliable.If can reduce the rate of fail, without frequent replacement bulbs, dispense with a lot of trouble.And using LED can save more energy.Leds appearance is smaller, more easily into the lamp holder, at the same time of take up less space, are more likely to cooperate with fashion lighting design.More importantly, LED brake lights start faster.LED brake lights light up time is only about 50 ms, faster than the start time of tungsten filament bulbs around 250 ms, which reduces the risk of being following vehicle collision.In addition, the LED is a solid-state light source, can withstand greater shock.